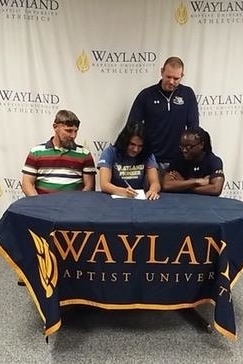 At the "Big Weekend" (in the first weekend of April) at Wayland Baptist College in Plainview, Texas, Doyline senior Brittany Bates was one of several athletes who signed a Letter of Intent to wrestle for the Pioneers this coming college season. 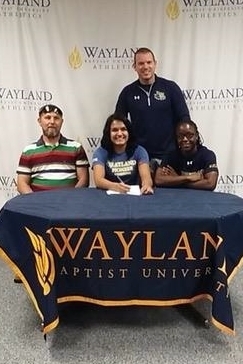 Flanked by Doyline coach John Smith on the left, Olympics team trials qualifier Tarkia Mensah on the right, and Wayland Baptist College wrestling coach Aaron Meister behind her, Doyline High School's Brittany Bates signs a Letter of Intent to wrestle for the Wayland Baptist College Pioneers in the fall. Bates, arguably Louisiana's best female wrestler to date, and definitely the one with the most national success, will graduate from Doyline High School on May 10th at the Minden Convention Center in Minden, Louisiana. She placed fifth in the LHSAA Division III state wrestling championships in 2014 and was the first girl to win the Brusly Invitational and Jacob McMillan Memorial tournaments, as well as state freestyle championships in Louisiana and Texas. She is a 16-time high school All-American in national competitions. After graduation Bates will move to her aunt's house in Houston to start training with the 2016 Texas National Team for the USAW National Championships in Fargo, North Dakota. Her last high school wrestling event, she will be training under coach Monica Allen, the U.S. Women's national coach. Bates hopes the best to come re wrestling is still ahead of her, and it very well may be under Wayland Baptist coach Aaron Meister, as well as surrounding herself with some of the best female wrestlers in the world. Bates will be joining four Pioneers who are ranked in the top-eight by Intermat: sophomores Marina Bricena (143), Brittany Marshall (170), Nahiela Magee (170) and senior Kierra Boyce (191). Wayland Baptist College debuted their female wrestling team in a tri-meet held on September 12th, 2010, against the defending Women's College Wrestling Association's national champion, Oklahoma City University, as well as the defending runner-up University of the Cumberlands. Suffice to say the Pioneers were waxed 49-0 and 44-1 in those two duals meets, but they have come a long way since then. In 2016 the Pioneers finished 8th in the WCWA National Championships out of 25 participating teams.